Our semi trailer is commonly used in transportation for military, vessel, spaceflight and extremity area .Vulcan is specialized in combination hydraulic low bed semi trailer and self walker for over-length, over-width, over-weight or super delicate equipment transportation. The loading capacity can cover 100 ton to 5000 ton. Business Description: Established in 2007, Yangzhou Vulcan Machinery Manufacturing Co., Ltd is located in Hanjiang Industrial Park, Yangzhou City, Jiangsu Province. It covers an area of 25,000 square meters and currently has 200 employees. Vulcan is a customized factory for special combination hydraulic semi trailer and multifunctional semi trailer. Vulcan has professional R & D team and strong production capacity; our special semi trailer is quite popular all over the world; till now we have get several technology patents. 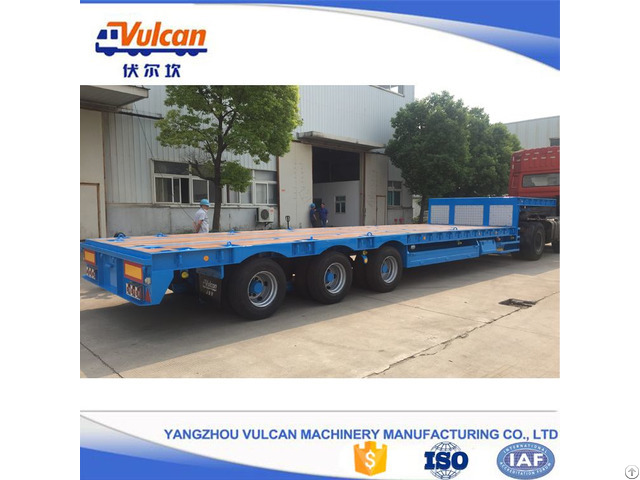 Vulcan is specialized in combination hydraulic low bed semi trailer and self walker for over-length, over-width, over-weight or super delicate equipment transportation. The loading capacity can cover 100 ton to 5000 ton. Our semi trailer is commonly used in transportation for military, vessel, spaceflight and extremity area .We have ten years’ sale experience in foreign market and the ability to design and produce based on customer’s requirements is quite strong. Vulcan adhere to the principle that providing customers high quality product and excellent service. We enjoy the right of import and export. Our semi trailers have exported to various countries and areas such as Japan, Europe, Africa, Mid-East .